Portugal is a beautiful country and I wish everyone the opportunity to visit as I did just recently. Portugal is famous for many products but probably port wine come to mind first. Port wine is a Portuguese fortified wine produced exclusively in the Douro Valley in the northern provinces of Portugal. 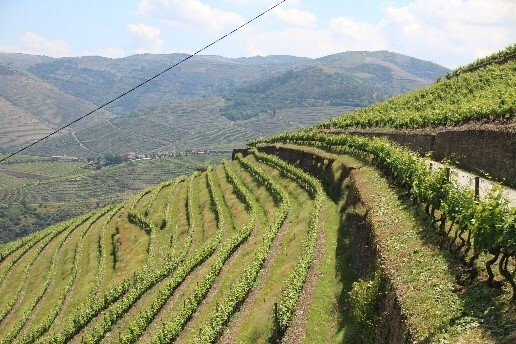 It is hard to grasp the human effort over the eons that have gone into building rock walled terraces that follow the contour of every inch of the Douro Valley. Much like the Mosel wine region in Germany, the Douro Valley is made up of incredibly steep slopes that one would think only a mountain goat would be able to traverse. But the Portuguese for centuries have scaled these steep slopes to hand harvest both grapes and olives. Stunningly beautiful! The climate in Portugal is heavenly, zone 9a to 10a for winter lows but without the blistering summer heat and humidity of south Florida, which has a similar hardiness zone. The average high in the hottest part of the summer is in the mid 70's to low eighties. Since most of the country appears to be built on a steep slope, I can't imagine the effort to walk anywhere if it were hot. One thing you notice is that almost all Portuguese, young or old, have what our travel agent describes as "ballerina" legs. After walking about for two weeks I now know why. The landscape is a gardener's dream…perfect for roses, camellias, orchids and any number of other temperate and semi-tropical plants. At one market I visited, one of the vendors was selling orchids. And not just measly little cuttings, but huge root bound clumps. Oh, how I wished I could have brought some of those clumps home. It was not uncommon to see huge camellia hedges and shrub/trees. Unfortunately we missed the peak bloom season, but there were enough hangers on to get a taste of their beauty. While visiting the Lello Bookstore in Porto, rumored to have inspired J.K. Rowling's depictions of Harry Potter's Hogwarts, I bought a book on the Camellias of Portugal, written in both English and Portuguese. The very next day, we visited the private gardens of Casa Villar d'Allen, and wouldn't you know, the current owner turned out to be a contributing author for that very book! Had I put it all together ahead of time, I would have taken my copy for her to sign but instead I have to be happy with a picture of her with her copy of the book. Did I mention cork? Let's just leave it that Portugal has a lot of cork oaks (Quercus suber) and in addition to their wine cork industry, you can buy just about anything made out of cork. It is hard to not think of all the craftsmen over the centuries that contributed to the beauty of Portugal. In additional to the impressive architecture, most of the city streets are still cobbled and the walkways made up of intricate tile work. Walking was not always the easiest, partly due to the unevenness and partly due to the distraction of its beauty.